Double-stud walls use common materials and familiar assemblies to create a low-tech, energy-efficient wall with lots of room for thick insulation. This framing method virtually eliminates thermal bridging through the studs and greatly reduces sound transmission through walls. The basic strategy is simple: The exterior walls are built from two parallel stud walls with a gap between the rows for extra insulation. Many builders use two parallel 2x4 walls with a 5-inch gap between them to create a 12-inch-thick wall. Of course, the wall can be thicker or thinner as circumstances dictate. The most commonly used insulation for this method of construction is dense-packed cellulose, although other types of insulation (including blown-in fiberglass, mineral wool batts, or open-cell spray polyurethane foam) can certainly be used. For more information, see GBA Encyclopedia: Double-Stud Walls. Although 6-mil interior polyethylene (installed as a combination air barrier and vapor retarder) is shown in some GBA details, it should only be included in buildings located in very cold climates (for example, Climate Zones 7, 8, or the colder sections of Climate Zone 6). In most areas of the U.S., interior polyethylene can cause problems, especially if the building is air conditioned. For more information, see Vapor Retarders and Vapor Barriers. You can choose from a wide variety of insulation materials to fill the spaces between studs, including cellulose, mineral wool, denim batts, fiberglass batts, blown-in fiberglass, or spray polyurethane foam. There really is no such thing as "bad" or "non-green" insulation — there are just different shades of "green," really. The main thing is how well the insulation slows heat gain or loss through conduction or air leakage — preferably both. Consider as well the environmental attributes of cavity insulation products — recycled content, recyclability, energy required in manufacture, ozone-depleting blowing agents. In some cases, the vapor permeance of an insulation can affect the performance of a wall assembly. Closed-cell spray polyurethane foam or air-sealed rectangles of rigid foam are the best insulation choices for insulating a rim joist cavity. 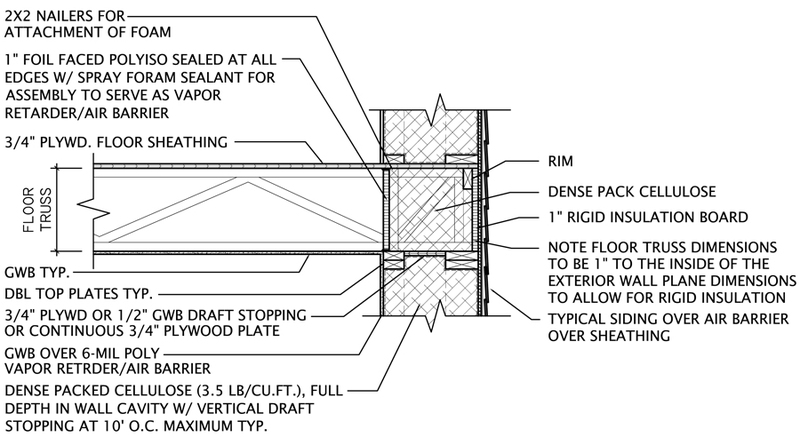 If the rim joist has been insulated with an adequate thickness of closed-cell spray foam or rigid foam, then additional layers of air-permeable insulation (for example, fiberglass batts) may be installed on the interior side of the foam insulation. 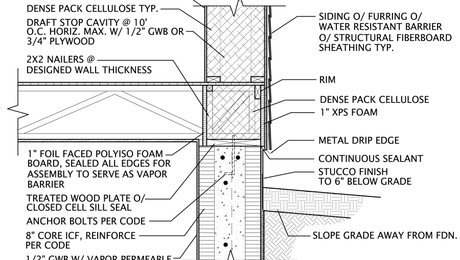 If the only type of insulation at the rim joist is an air-permeable product like fiberglass batts, moist interior air can migrate through the fiberglass, allowing moisture to condense on the cold rim joist. That's why rim joists behind fiberglass insulation are often moldy or rotten. Engineered floor joists make more efficient use of wood and are therefore preferred over solid lumber joists. 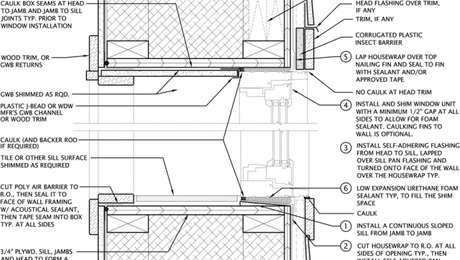 Engineered floor joists are easy to integrate with advanced framing techniques and often include openings for easy installation of ductwork. Most or all of the GBA details with floor framing show I-joists. In general, deep framing members are more resource-efficient if they are engineered rather than solid sawn. 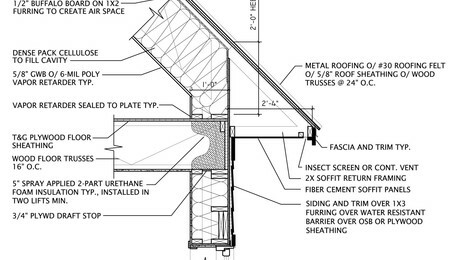 Another resource-efficient option is open-web floor trusses, particularly in homes with forced-air HVAC systems; they can more readily accommodate ducts and make the duct distribution system more efficient. 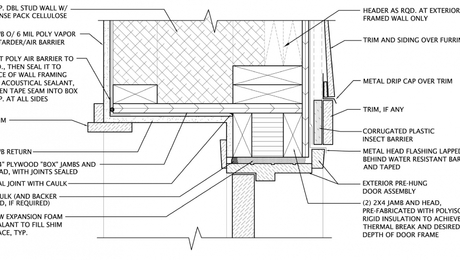 Moving from one floor framing system to another, particularly from solid-sawn to any engineered system, is not a completely straightforward one-for-one proposition. As with roof trusses, there are some special engineering considerations, particularly for blocking. When installed on an attic floor, cellulose is a type of loose-fill insulation. However, when installed in a closed cavity, cellulose is usually installed by the dense-pack method. After the cavity is enclosed with an air-permeable membrane like InsulWeb or with a durable material like OSB, plywood, or gypsum drywall, the insulation installer blows cellulose through a hose into the cavity until the insulation reaches a minimum density of 3½ pounds per cubic foot. For more information on the dense-pack method, see How to Install Cellulose Insulation. The exterior foam detail provides between R-5.4 and R-13, depending on the type and thickness of the selected foam. In most climates, it’s wise to also include additional insulation on the interior side of the rim joist. The exterior of the wall is sheathed and finished conventionally, although a rainscreen ventilation gap between the sheathing and siding is often recommended. Most framers erect the outer wall separately and first; this approach most resembles conventional stud-wall construction. When framing the inner wall, it is important to align the window and door openings perfectly. The openings are usually joined together using plywood or OSB box frames, like big gussets. The studs in the two walls can be either aligned or staggered, but they must line up at the rough openings.